CBI - China: Day 40 of 41 of the 1st Battle of Shanghai, Manchuria. CBI - China: Day 66 of 142 of the 1st Battle of Hebei. The Japanese 16th Brigade attacks the Gubeikou Pass but is repelled by the Chinese 67th Corps. Germany: German troops cross the Hohenzollern Bridge in Cologne thus taking control of the Rhineland. Meanwhile Hitler dissolves the Reichstag and calls for re-elections in Germany. Spain: Day 234 of 985 of the Spanish Civil War. Spain: Day 599 of 985 of the Spanish Civil War. CBI - China: Day 244 of 2,987 of the 2nd Sino-Japanese War. Day 29 of 124 of the Battle of Henan. In a letter to his family, an American surgeon in China writes, "A conservative estimate of people slaughtered in cold blood is somewhere about 100,000, including of course thousands of soldiers that had thrown down their arms." Spain: Day 964 of 985 of the Spanish Civil War. CBI - China: Day 609 of 2,987 of the 2nd Sino-Japanese War. Atlantic: The British capture 9 Italian ships carrying German coal in the English Channel. The Italians see this as a British attempt to force the Italians to sell them weapons. ETO: Hitler allocates 8 divisions for the invasion of Norway and Denmark. Finland: Day 99 of 105 of the Russo-Finnish War. Soviet troops begin breaking through the final defense line at Viipuri, Finland (Baltic Sea). Finnish Prime Minister Ryti arrives in Moscow in an attempt to negotiate peace. British Chief of the Imperial General Staff offers military assistance to Finland. CBI - China: Day 975 of 2,987 of the 2nd Sino-Japanese War. Day 114 of 381 of the Battle of South Guangxi. Day 40 of 67 of the Battle of Wuyuan. Atlantic: German submarines attack an Allied convoy 320 miles northwest of Scotland. British whaling ship TERJE VIKEN and British tanker ATHELBEACH are sunk. Atlantic: German submarine U-47 is sunk by the British destroyer HMS WOLVERINE. Atlantic: German submarine U-70 is rammed by Dutch tanker MIJDRECHT, then sinks after four-hours of depth charges by corvettes HMS CAMELLIA and HMS ARBUTUS. Atlantic: German submarine U-37 sinks the Greek ship MENTOR in the North Atlantic. Atlantic: Twelve German motor torpedo boats attack British convoys off East Anglia, England, sinking 5 ships. Atlantic: The German battleship BISMARCK enters the Kiel Canal. Atlantic: German battlecruisers SCHARNHORST and GNEISENAU sight an Allied convoy near the Azores, but do not attack due to the presence of the British battleship HMS MALAYA. ETO - UK: Day 183 of 258 of the Blitz. Germany: German Jews are ordered into forced labor. MTO - Greece: British and Commonwealth troops arrive in Greece and begin disembarking. East Africa: Day 271 of 537 of Italy's East African campaign in the lands south of Egypt. East Africa - Eritrea: Day 31 of 56 of the Battle of Keren. CBI - China: Day 1,340 of 2,987 of the 2nd Sino-Japanese War. CBI - Thailand: Day 158 of 221 of the Franco-Thai War (Vichy France vs Thailand). Atlantic: Day 53 of 169 of Germany's Second "Happy Time," during which U-boats sink 609 Allied ships with little risk. German submarine U-126 sinks US freighters BARBARA and CARDONIA between Cuba and Haiti. U-155 sinks Brazilian ship ARBABUTAN 50 kilometers off the coast of North Carolina. Russian Front - North: Day 181 of 872 of the Siege of Leningrad. Russian Front - North: Day 28 of 102 of the Battle of the Demyansk Pocket, another failed attempt to break the siege at Leningrad. Russian Front - North: Day 44 of 103 of the Battle of the Kholm Pocket. Another attempt to break the siege at Leningrad. Russian Front - Center: Day 59 of 103 of the Battle of Vyazma, Russia. Russian Front - Center: Day 59 of 103 of the Battle of Sychevsk, Russia. Russian Front - Center: Day 5 of 49 of the Battle of Rzhev, Russia, a diversion to pull more German troops away from Moscow. Russian Front - South: Day 129 of 248 of the Siege of Sevastopol, Crimean Peninsula. All German attacks against Sevastopol are shut down for the winter. CBI - Burma: Day 84 of 164 of Japan's Invasion of Burma. CBI - Burma: Day 5 of 5 of the Battle of Pegu. The Japanese take Pegu while the British begin evacuating Rangoon. CBI - Burma: Day 1 of 2 of the Battle of the Taukkyan Roadblock. CBI - China: Day 1,705 of 2,987 of the 2nd Sino-Japanese War. Day 74 of 99 of the 3rd Battle of Changsha. CBI - Java: Day 8 of 13 of the Battle of Java. The Government of the Dutch East Indies flees to Australia. PTO - Borneo: Day 82 of 107 of the Battle of Borneo. PTO - Malaya: Day 17 of 357 of the Battle of Timor Island. PTO - New Guinea: Japanese launch Operation MO as troops invade Salamaua and Lae on mainland New Guinea. PTO - Philippines: Day 90 of 152 of the 1st Battle of the Philippines. 5th Air Force provides air support. Atlantic: A new wolfpack of 13 subs, code-named RAUBGRAF (Robber Baron), is formed in the central North Atlantic and immediately sent to attack a convoy between North America and the UK. Germany: Roma and Sinti people from occupied Poland and Soviet Union begin arriving at the Auschwitz Concentration Camp in Poland. Meanwhile 4,500 Croatian Jews are arrested. Russian Front - North: Day 546 of 872 of the Siege of Leningrad. Russian Front - North: Day 26 of 51 of the USSR's Operation POLAR STAR, a failed offensive north of Leningrad, hoping to take the southern shore of Lake Ladoga, Russia. Russian Front - North: Day 307 of 658 of the Siege of the Kholm Pocket, USSR lays siege to the Kholm Pocket but the Germans hold out for a about a year and a half. Russian Front - Center: Day 6 of 30 of the 3rd Battle of Rzhev-Sychevka, Russia. Russian Front - South: Day 17 of 25 of the 3rd Battle of Kharkov, Ukraine. MTO - Tunisia: Day 111 of 178 of the Battle of Tunisia. RAF and US Air Forces provide Allied air support. The rear guard of the retreating Germans engage the pursuing Allied troops south of the Mareth Line. CBI - Burma: Day 77 of 104 of the 1st Battle of Arakan. US 10th Air Force provides air support. CBI - Burma: Day 28 of 79 of the Allied Operation LONGCLOTH. CBI - China: Day 2,070 of 2,987 of the 2nd Sino-Japanese War. PTO - Alaska: Day 274 of 435 of the Battle of Kiska, Aleutian Islands. US 11th Air Force warplanes bomb the Chichagof Harbor area, the Holtz Bay installations, North Head and the Main Camp area. 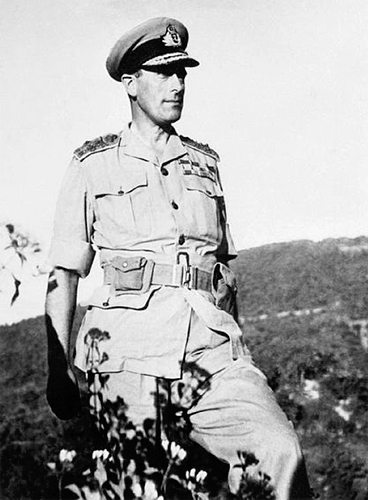 CBI: While traveling in a jeep in northern Burma, Louis Mountbatten, Supreme Allied Commander South East Asia Command, is accidentally struck by fragments of a bamboo plant that render him temporarily blind due to internal hemorrhage. Mountbatten's contributions to WWII went far beyond his command in South East Asia. Prior to becoming Supreme Allied Commander, he had been Chief of Combined Operations. Photograph taken during his tour of the Arakan Front, February 1944. 3) the development of amphibious Tank-Landing Ships. 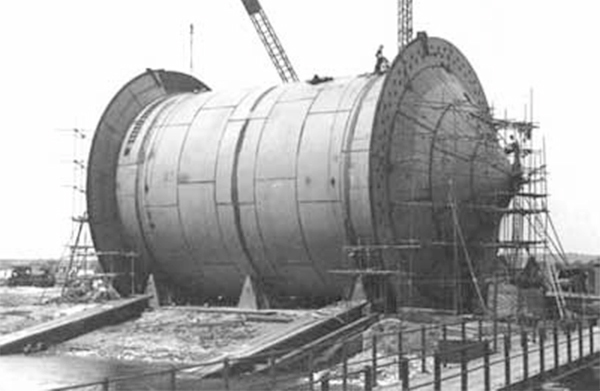 Shown above: Construction of an enormous floating conundrum designed to float behind a ship and spool off flexible pipe onto the bottom of the English Channel. PLUTO was an acronym for PipeLine Under The Ocean. 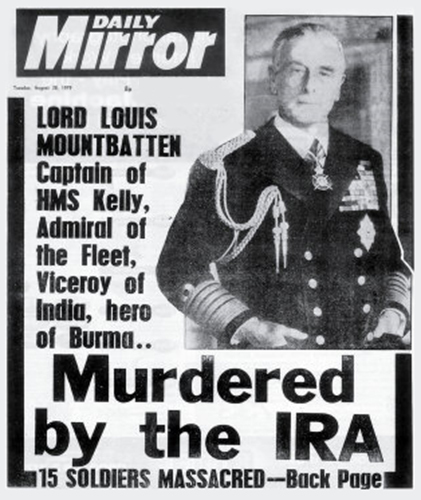 Mountbatten was assassinated in 1979 by the Provisional Irish Republican Army (IRA), who planted a bomb in his fishing boat. USA: The United Nations War Crimes Commission organizes a subcommittee to study claims that accused war criminals were merely following orders. USA: In reply to Arab protests, the US says that the idea of a Jewish state has no official sanction. ETO - France: US 9th Air Force B-26s and A-20s attack V-weapon sites on the Channel coast and military installations near Criel-sur-Mer and Greny. Germany: Himmler informs the Security Police, the Security Service and the SS Central Office that no prisoners are allowed to be released from the Mauthausen Concentration Camp. Germany: The 69th transport from Drancy Concentration Camp in Paris departs for Auschwitz Concentration Camp with 1,501 prisoners. Upon arrival 1,311 of them will be immediately gassed. Poland: German Gauleiter Arthur Greiser, governor of the Wartheland in occupied Poland, reports to Heinrich Himmler that the Jewish population there has nearly been wiped out. Poland: 38 Jews hiding at 84 Grojecka Street in Warsaw are arrested along with 6 non-Jewish Poles for helping them. Included is historian Emmanuel Ringelblum, who will soon be executed. Russian Front - North: Day 35 of 191 of the Battle of the Narva Isthmus, Estonia. Both German and Soviet troops in the Baltic region go on the defensive. Russian Front - South: Day 75 of 113 of the USSR's Dnieper-Carpathian Offensive in southwestern Ukraine. Russian Front - South: Day 4 of 45 of the Battle of Chernovtsy, Ukraine. Russian Front - South: Day 2 of 44 of the Battle of Snigirevka, Ukraine. MTO - France: US 15th Air Force B-17s bomb a submarine base at Toulon. MTO - Italy: The Fascist government in northern Italy issues another order protecting Jews above the age of 70 and those with mixed ethnicities, but the Germans ignore the order. MTO - Italy: Germans arrest those staying at the Jewish hospices at Turin sending them to the Fossoli transit camp. Many of them will end up at Auschwitz. MTO - Italy: Day 51 of 123 of the Battle of Monte Cassino. RAF and US Air Forces provides air support for the Allied ground troops. MTO - Italy: Day 46 of 136 of the Battle of Anzio. RAF and US Air Forces provides air support for the Allied ground troops. CBI - Burma: Day 69 of 99 of the 2nd Battle of Arakan. CBI - Burma: Day 3 of 166 of the UK's Operation THURSDAY. Elements of the Japanese 33rd Division cross the Manipur River and head toward Tiddim near the Burmese-Indian border kicking off their Imphal-Kohima offensive from northern Burma into Assam, India. CBI - China: Day 2,436 of 2,987 of the 2nd Sino-Japanese War. PTO - New Guinea: Day 8 of 80 of the Battle of the Admiralty Islands. 5th Air Force provides air support. US Marines secure Los Negros Island. PTO - New Guinea: Day 171 of 219 of the Battle of Shaggy Ridge. US 13th Air Force provides air support. PTO - New Guinea: Day 84 of 597 of the Battle of New Britain. 5th Air Force provides air support. US Marines land at Talasea. PTO - Solomon Islands: Day 128 of 295 of the Battle of the Bougainville Islands. US 13th Air Force provides air support. ETO: Day 47 of 66 of the Battle to the Rhine. Day 1 of 20 of the Battle of Ramagen. The US 9th Armored Division makes a surprise dash across the undestroyed Ludendorff bridge over the Rhine at Remagen, establishing a crucial bridgehead on the east bank where the US 1st Army begins to cross, while the US 9th Air Force provides air support. The unexpected capture of the Ludendorff Bridge over the Rhine shortened the war in Europe to no small degree. After capturing the Siegfried Line, the 9th Armored Division of the US First Army advanced unexpectedly quickly toward the Rhine and was very surprised to see the railroad bridge still standing. The Germans had wired the bridge with about 6,200 lbs of demolition charges. When they tried to blow it up, only a portion of the explosives detonated. 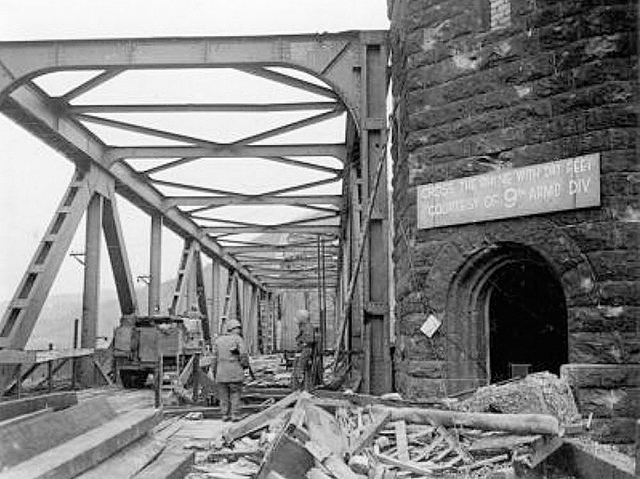 US forces captured the bridge and rapidly expanded their first bridgehead across the Rhine. The sudden capture of a bridge across the Rhine was front page news in American newspapers, touting it as one of the top five events of the entire European was, alongside D-Day. The GIs' actions prevented the Germans from regrouping east of the Rhine and consolidating their positions and allowed the Allies to rapidly transport five divisions across the Rhine into the Ruhr, Germany's industrial heartland. 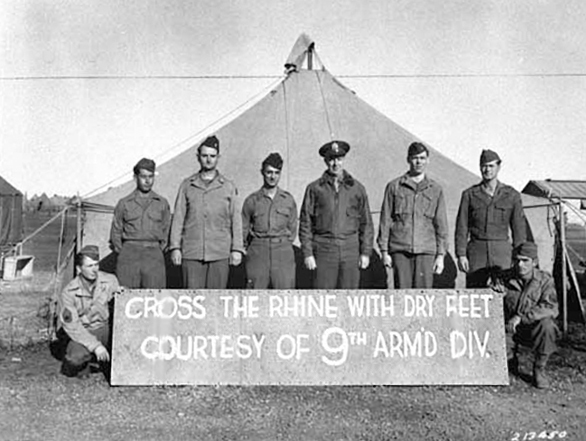 This was two weeks before the launching of Operation PLUNDER, the coordinated set of Rhine crossings by the British 2nd Army and the US 9th Army. The next ten days saw some very fierce action by Germany using virtually every weapon at their disposal to try to destroy the bridge, while the Americans positioned the largest concentration of anti-aircraft weapons during WWII. On 17 Mar 45, Hitler ordered the launching of 11 V-2 rockets to destroy the bridge, marking the only time the missiles were used against a strategic objective. The inaccurate V-2s killed six Americans and a number of German civilians, but failed to hit the bridge, let alone destroy it. The missiles landed as far as 40 miles from target. After nine sorties over six days, the bridge was finally brought down on 17 Mar 45 by German AR-234 jets carrying external bombs. Seven German jets were lost in the effort, two downed by Allied aircraft. C Company, 9th Armored Engineer Battalion welcomed troops with this sign which can be seen mounted at the approach to the bridge in the first photo. ETO - UK: A German V-2 rocket hits Trundleys Road at Folkestone Gardens (London) destroying two blocks of homes, killing 52 and seriously injuring 32. ETO - France: Day 219 of 284 of the Battle of Brittany. ETO - France: Day 174 of 236 of the Siege of Dunkirk. ETO - Germany: Day 1 of 46 of the Battle of the Ruhr Pocket. The end of this battle will mark the end of all major organized resistance on Nazi Germany's Western Front. Over 300,000 German troops will be taken prisoner. ETO - Germany: Day 16 of 36 consecutive RAF night raids on Berlin. ETO - Germany: US 8th Air Force B-24s bomb Soest and Bielefeld while B-17s bomb at Horderverein, Harpenerweg, Dortmund, Paderborn, Siegen, Datteln, Giessen and Castrop. Russian Front - Finland: Day 174 of 223 of the Lapland War. Finland and Russia have joined forces to kick the Germans out of Finland's most northern province. Russian Front - Center: Day 144 of 206 of the Battle of the Courland Pocket in Latvia. Russian Front - Center: Day 42 of 75 of the Battle of Königsberg, East Prussia (now Kaliningrad, Russia). Russian Front - Center: Day 41 of 63 of the Battle of the Heiligenbeil Pocket in East Prussia. Russian Front - Center: Day 26 of 54 of the Battle of East Pomerania, Germany. Soviets capture Rügenwalde, Germany (now Darlowo, Poland). Russian Front - Center: Day 23 of 83 of the German Siege of Breslau (today Wroclaw, Poland). Russian Front - Center: Day 4 of 15 of the Battle of Kolberg, Germany (today Kolobrzeg, Poland). Russian Front - South: Day 2 of 11 of the failed German Operation FRÜHLINGSERWACHEN (Spring Awakening) at Lake Balaton, Hungary. The idea was to destroy their oil fields. Russian Front - South: Day 2 of 16 of the Battle of Drava (a river in Bulgaria). Germans attack the Bulgarians, hoping to distract the Soviet advance on Berlin. CBI - Burma: Day 48 of 61 of the Battles of Meiktila and Mandalay. The US 10th Air Force provides air support. CBI - Burma: Day 32 of 99 of the Battle of Pakokku and Irrawaddy River operations in central Burma. The US 10th Air Force provides air support. CBI - China: Day 2,801 of 2,987 of the 2nd Sino-Japanese War. PTO - Alaska: US 11th Air Force B-24s bomb on Kataoka, Shimushu Island. PTO - Japan: Day 17 of 36 of the Battle of Iwo Jima. US 7th Air Force provides air support. PTO - New Guinea: Day 436 of 597 of the Battle of New Britain. US 10th Air Force provides air support. PTO - New Guinea: Day 320 of 481 of the Battle of Western New Guinea. US 10th Air Force provides air support. PTO - Philippines: Day 139 of 299 of the 2nd Battle of the Philippines, aka the Liberation of the Philippines or the Philippines Campaign. PTO - Philippines: Day 83 of 244 of the Battle of Luzon. 5th Air Force provides air support.